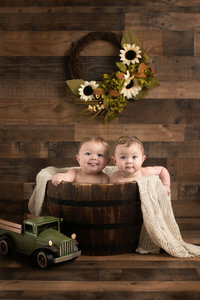 My Belly & Baby Plan includes both a maternity session (on location or in studio), as well as a full newborn session, which includes baby only poses, as well as parent & sibling poses. This is one of my most popular & beloved session combinations. Booking these session as a combo offers a nice discount in the combined session fees. Stacie contacted me last August looking to sign up for my Belly & Baby Plan. We first met up at the end of September for her maternity session at the very top of Mt. Lemmon. It was a perfect day, and we created some beautiful memories for them. The light & scenery was picture perfect, and I have no doubt that this maternity gallery is one of my very favorites! Every Momma-to-be deserves a great silhouette image of their body at it’s curviest! Makenzie arrived in Mid-November, as a wonderful Thanksgiving blessing. She was tiny & perfect, and just as beautiful as her parents! Of course being a holiday baby, we had to include some Thanksgiving & Christmas prop setups. She was such a good baby & let me play with lots of different sets & poses. She was also a very smiley baby. I usually will capture at least one smile during a newborn session, but she was smiling in almost every pose! What a sweetheart! I always try to include some macro closeups of those sweet & tiny newborn features, that they grow out of in only a few short weeks. Features like their baby fine whispy hair, stubby eyelashes, tiny fingers & toes, kissy lips, and fuzzy ears.